compares and reviews digital cameras versus film through 2009. See my latest camera model recommendations. Read the book “Light Travel: Photography on the Go” for the story of how a photographer’s switch from film to digital cameras inspired new creativity. 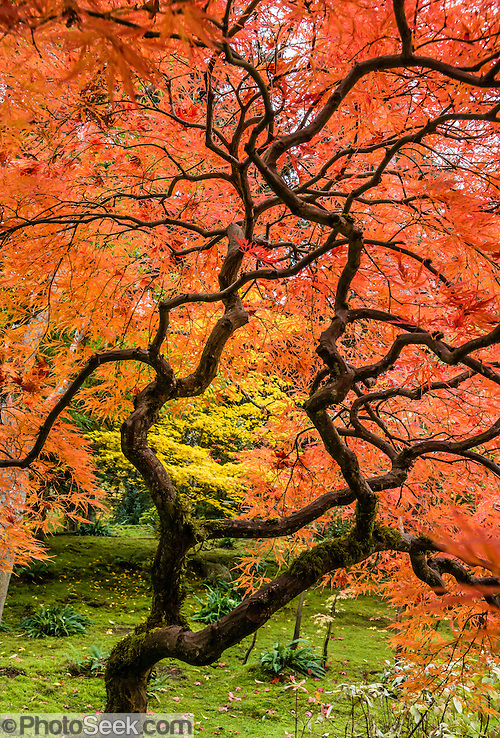 Get more out of your digital camera using Tom Dempsey’s helpful tips. Support my work — buy anything after clicking this Amazon.com link. PhotoSeek creator Tom Dempsey reveals his favorite photographic gear adopted from 1978-2018. For travel and nature photography, I look for portable, high-quality cameras on a moderate budget. I’m not tied to any one system or brand. Instead, I upgrade to the latest, best tool for the job. Former gear is easily sold locally via Craigslist.org, in-person for cash. See my latest recommendations: BEST TRAVEL CAMERAS REVIEW. Below, buy linked items at Amazon.com to support Tom’s work. Since 1978 I have regularly updated my technology as follows (newest at top, oldest at bottom). The versatile Sony RX10 IV or III dust-resistant camera has a superb 25x zoom 24-600mm equivalent f/2.4-4 lens. Read my review of Sony RX10 IV/RX10M4, the ultimate travel camera. I acquired Sony Cyber-shot DSC-RX10 III (Amazon) when first released in May 2016 (read my review of version III). Upgrading to Sony RX10 IV (buy at Amazon) in 2018 bought faster autofocus, touchscreen AF, and reorganized menus. Both III and IV are just 37 ounces (with battery and card); plus adding 5 oz for strap, lens filter, cap & hood makes 42 oz. Its “sealed body” keeps out dust and has a bright f/2.4-4 lens with vast 25x zoom, sharp throughout its remarkable 24-600mm equivalent range. I no longer need a pocket camera for improving close-focus shots, as RX10 already has a 1″-Type sensor — its depth of field, deeper than APS-C sensor cameras for a given f-stop, enhances details from close flower shots to distant bird feathers all the way to 600mm equivalent telephoto. RX10 IV is the world’s most versatile camera for on-the-go photographers. TIP: Despite Sony’s claim of “dust and moisture-resistant” body, DON’T EXPOSE YOUR RX10 IV or III CAMERA TO RAIN (even if immediately wiped off), as wind-driven droplets killed my RX10 III. Despite its weather sealing effectively keeping dust and condensation out of the lens throughout 16 months, one fateful rainstorm short-circuited its focus and LCD (sadly outside of its 1-year Sony Warranty). Rather than risking an estimated $656 repair (whose 90-day guarantee is voided by “liquid damage”), I bought a new European RX10 III (in York, England, to complete my UK photo shoot) which I soon sold on Craigslist in Seattle, after upgrading to the superior RX10 IV. Introduced in April 2016, the best value camera for capturing indoor events or action with fast autofocus is my Sony Alpha A6300 (2016, 14 oz body + 4 oz 24-75mm equiv zoom) (buy at Amazon with 16-50mm f/3.5-5.6 OSS kit lens) . To try to beat my RX10M3, I sold A6300’s inferior kit lens and upgraded to a pricier, sharper Sony Vario-Tessar T* E-mount 16-70mm F4 ZA OSS 4x-zoom lens (11 oz, SEL1670Z, 2013), which slightly beats Sony SELP18105G and SEL-18200 from 18-70mm. But the sharp, versatile Sony RX10 IV has nearly antiquated my A6300 (which is only 0-5% sharper). Sony’s A6300 (read my review) demands the sharpest E-mount lenses to leverage its APS-C sensor, in order to rival the marvelous optics of Sony RX10 IV or III. For indoor events using the A6300, my older Sony SEL18200 lens struggled to keep up with RX10 III or IV outside of a 30-60mm equivalent sweet spot. Improved autofocus on RX10 IV now means I tend to leave the A6300 at home to reduce luggage when flying abroad, except on professional shoots where I need a top camera for backup, indoor events and sharper night photos. The best and brightest pocketable 8x-zoom camera is Sony Cyber-shot DSC-RX100 VI / RX100M6 (2018, 11 oz, 24–200mm f/2.8-4.5). Read my RX100M6 review. For less than half the price, image quality is nearly as good with my earlier Panasonic Lumix DSC-ZS100 (2016, 11 oz, 25-250mm equivalent lens f/2.8-5.9). Read my ZS100 review. Samsung Galaxy Note9 with 512 GB storage, handy stylus (7.1 oz, plus screen protector and case): improves the camera and extends battery. Waterproof rating IP68 = deemed to withstand dust, dirt, sand, and submersion up to a depth of 1.5m underwater for up to thirty minutes. Underwater, shockproof, dust-resistant Olympus Tough TG-4 (2015, 8.7 oz, 25-100mm equiv) compromises image quality but is good for underwater movies. Lightweight alternative: CaliCase Universal Waterproof Case lets you operate your smartphone when hiking in the rain or swimming underwater! For a top camera, consider Samsung Galaxy Note 8 with stylus, Google Pixel 2, or Apple iPhone versions 7 or later. I highly recommend Adobe Creative Cloud Photography plan (Lightroom Classic CC + Photoshop CC) which elegantly organizes images and speeds editing! Lightroom easily and automatically exports image files to attractive web pages, or to files of any size, such as for e-mail or Microsoft PowerPoint presentations. Lightroom can place a copyright watermark on exported images. Major improvement in 2017, CC Lightroom version 7.1: the Auto adjust button now works so well that I may use it every time, for huge savings on editing time! Apply it upon Import as a “Develop Settings > User Preset > (created previously with ‘Auto Settings’ checked)”. This new Sensei powered “Auto” uses artificial intelligence to adjust the most important Develop settings for Exposure, Contrast, Highlights, Shadows, Whites, Blacks, Vibrance, and Saturation. If you have photos that were previously edited in a much older version of Lightroom, be sure to select them all and use “Develop module > Settings > Update to Current Process” to make available the latest editing capabilities for Auto, Shadows, Highlights, Adjustment Brush, etc. Lightroom bug sorting videos: To properly sort videos by Capture Date, put them in folders separate from still files, or else the movies will appear in unexpected order. Reported workaround: Select all the videos; then Metadata > Edit Capture Time; then click OK (without needing to edit each one). 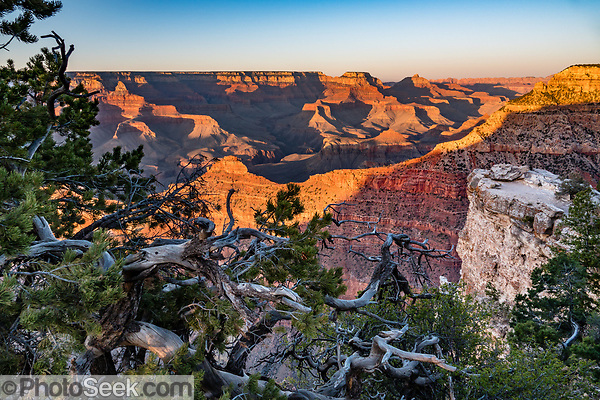 In April 2015, Lightroom version 6 added Photo Merge to Panorama and to HDR, with raw file input and high-quality output to Adobe Digital Negative DNG files. A good FREE option for stitching panoramas from multiple images is Image Composite Editor (ICE) released in 2015 from Microsoft Research Computational Photography Group (faster and sharper than using Adobe Photoshop CS5). Lightroom helped me edit and organize 2-3 times more per week compared to Canon ZoomBrowser, or to Adobe Photoshop with Bridge. Lightroom smartly stores its non-destructive editing commands & labels in a powerful database (and in .XMP sidecar files for raw), compatible with JPG, TIF, and most camera raw files. To protect your edits and metadata changes against the rare event of a damaged Lightroom catalog, be sure to “Automatically write changes into XMP” (which unfortunately isn’t the default) set under Lightroom’s Edit menu > Catalog Settings > Metadata. But backing up DNG file edits must be done manually, with the command “Update DNG Preview and Metadata” under Metadata menu. DNG is advantageously compressed 20% smaller than camera raw, but using sidecar+raw instead may be faster and more secure against file corruption. The writing time for a whole DNG file takes much longer than a quick write to a tiny sidecar XMP file. So long as you “Build Previews 1:1” at Import time as I do, Lightroom preview speeds should be similar or better using raw+sidecar compared to DNG. Synchronizing a folder of thousands of images should be much quicker with raw+sidecar than with DNG. I don’t see an advantage in converting old or importing new raw shots to DNG. As of 2015, Adobe Lightroom version 6 still handles my oldest raw files from Canon Powershot G5 camera of 2003 and Sony NEX 7 raw (2012-15). To simplify your workflow and printing, use sRGB color space outside of Lightroom (Edit>Preferences>External Editing tab), such as when launching Photoshop. Costco makes great 40-year prints on Fuji Crystal Archive Paper using default sRGB color space at 300 dpi. Most monitors and cameras use sRGB color space as a default practical standard. Adobe Lightroom ties you to the expense of updates, or ongoing CC subscription, required for raw file compatibility for future cameras that you may purchase. If your Lightroom CC subscription expires, you can still view, organize and export (but not Develop) images. Polarr.co edits very well, especially the $20 Pro version with important Brush Mask and batch processing. But Polarr loads only 50 images at a time, and requires external organizing software. Polarr image size must be ≤40 megapixels (so you must edit the entire set of images before using a stitcher like FREE Image Composite Editor to merge a large panorama). FastStone Image Viewer 3.6 Freeware, www.faststone.org. Fast and capable, especially if you use raw files. Downloads, views, edits and exports still images, including most camera raw files. FastStone does not view or download movies or sound files. Apple Photos (or earlier iPhoto) is not bad, but each edit creates a new JPEG file. In 2014, Apple ceased development of its Aperture and iPhoto apps, replacing both with “Photos for macOS.” Version 3 and later of both Apple Aperture and Adobe Lightroom helpfully cataloged movie files. Google Photos: good across multiple platforms but requires internet connection. 16mp max per photo. 15 gb free storage on Google Drive (then $2/month per 100 gb up to 30 TB as of 2017). While Adobe Lightroom handles 95% of my editing, the remaining 5% of my very best images, printing, and book production still require Photoshop. Most people don’t need Photoshop, since Adobe Lightroom covers most advanced photo editing needs. Upgrade history: Adobe upgraded to CS5.5 in 2011, to CS5 in Fall 2009, to CS4 in Fall 2008. Photoshop version CS5 worked well for me. CS5 through CS3 have support for 16-bit Adjustment Layers and greatly improved Photomerge, to seamlessly stitch 16-bit panoramas from multiple 16-bit images (now antiquated by Lightroom 6.x and CC with Photomerge). makes flexible photo shows combining images, music, videos, labels & charts with nice cross-fades between frames for display on a computer or digital projector. Subscribing to Microsoft Office 365 Home includes PowerPoint, Word, Excel, and Outlook; supports 5 PCs or Macs, 5 tablets, and 5 phones; has unlimited customer service; and is cheaper than buying standalone copies separately for PC and laptop. Alternative show software: Proshow Producer has flexible output formats at all resolutions. 60-inch Samsung digital HD TV monitor with LED Backlight (Tom’s usage 2012 – present): As of October 2012, our living room shows are upgraded with a spectacular 60-inch Samsung digital TV with LED Backlight technology, 1920 x 1080 pixels, displaying photographs with excellent tonal impact and realism. Impressive full-array backlight LED LCD television technology with local dimming has noticeably deeper blacks and greater dynamic range than edge-lit LED LCD and is worth the slightly thicker box. Mount on the wall to save floor space. LED LCD televisions use half the power of bulky old CRT (Cathode Ray Tube) models. Connect the large digital television via HDMI socket to a laptop computer. Darkening the room is no longer necessary because LED televisions make presentations brighter than projectors (such as Canon Realis SX60 or SX50). Best projector under $1000: BenQ HT2050 DLP HD 1080p Projector (at Amazon.com) – 3D Home Theater Projector with All-Glass Cinema Grade Lens. Or older, slightly cheaper BenQ HT1075 is almost as good. My older Canon Realis SX50 digital projector (Tom’s usage December 2005 – present) displays impressive multimedia presentations using Microsoft Powerpoint run on a notebook computer, dynamically superior to a slide film projector. The SX50 projects a spectacular movie theater experience, especially with a 6-speaker Surround Sound system. The Canon Realis SX50 projector features SXGA+ (1400 by 1050 pixels); great 1000 to 1 contrast; 2000 actual lumens; true 720p HD broadcast for movies. $4000 in December 2005, then price dropped to $3500 in October 2006. It has keystone correction, a great dynamic range (from highlights to shadows), and sharper focus than slide film projectors such as the Kodak Carousel 4600. The SX50 is well optimized to show images in default sRGB mode, as captured by digital cameras. On my trusty old Kodak Carousel 4600 film projector, the contrast ratio is more limited, requiring a darker room than Canon SX50; and you must wait for the curved film in each slide mount to warm up and pop into focus, which still annoyingly leaves the edges or center out of focus, even with the compensating lens and autofocus. In contrast, digital projectors focus crisply & brightly across the entire image! 64-bit Windows 10 Pro operating system. LCD monitor: ASUS 32″ 4K Ultra HD ProArt Professional Monitor [PA328Q] IPS 16:9. Pioneer Slim External Blu Ray Writer BDR-XD05B (Black) 6x Portable USB 3.0 BD/DVD/CD Burner, works with both my PC and laptop. I love its elegant profile, great keyboard & handy touchscreen! 15.6″ 3840×2160 pixels diagonal UHD UWVA eDP BrightView WLED-backlit screen. plus 16 GBNVIDIA GeForce 940MX (2GB GDDR5 dedicated) video graphics. 16 GB DDR4-2133 SDRAM. 1 TB Solid State Drive (SSD). 64-bit Windows 10 Pro operating system. .
Use a 64-bit Windows or Apple operating system (not 32-bit). Recommended: external portable Blu-Ray player, writer/DVD recorder (made optional due to large cheap 16gb memory cards, USB memory sticks, or cloud storage) can be used on both laptop & PC. Install Photoshop, Lightroom program and database onto a RAM drive or SSD for faster speed of loading and running. Photoshop sped up when I added a very fast internal hard drive (10,000 rpm) to host the swap file of Adobe Photoshop CS3. Adobe Lightroom versions 1.3 and 1.4 also sped up when “Lightroom Catalog.lrcat” image database was moved onto the fast drive. Despite having 4 gigabytes RAM memory on your computer, Photoshop CS3 only takes advantage of one gigabyte of memory before memory starts slowly swapping to disk. Workaround: Upgrade to faster CS4, a 64 bit application. My computer 2009-2012 was a Dell XPS 420 Workstation (2.4 GHz Quad-Core processor) with 4 gigabytes RAM memory, running Windows Vista operating system, using the 24 inch Dell 2407WFP-HC Ultrasharp widescreen Flat Panel LCD monitor, 1920 x 1200 pixels, and 1000:1 Contrast Ratio. Main image storage was on a 2 terabyte RAID 0 internal hard-drive pair backed up to 1.5 or 2 TB external USB drives. To write to CD/DVDs on my Dell Workstation and Laptop, I had to use the provided Roxio program, instead of Windows XP or Vista (which poorly handle CD/DVD disk writing). For external backup or storage, get an external 1 or 2 Terabyte (TB) drive with eSATA or USB 3.0 connection. eSATA is as fast as your internal hard drive connection, much faster than Firewire or USB 2.0. New computers after 2011 may come with fast USB 3.0. On your laptop, for more reliable mouse control on your touchpad, disable the annoying Tap feature, which often mistakes your mouse finger movements for a click or double click. Disable Tap in Windows XP or Vista > Control Panel > Mouse > Touchpad. Instead of the Tap feature, rely on the Left and Right buttons. 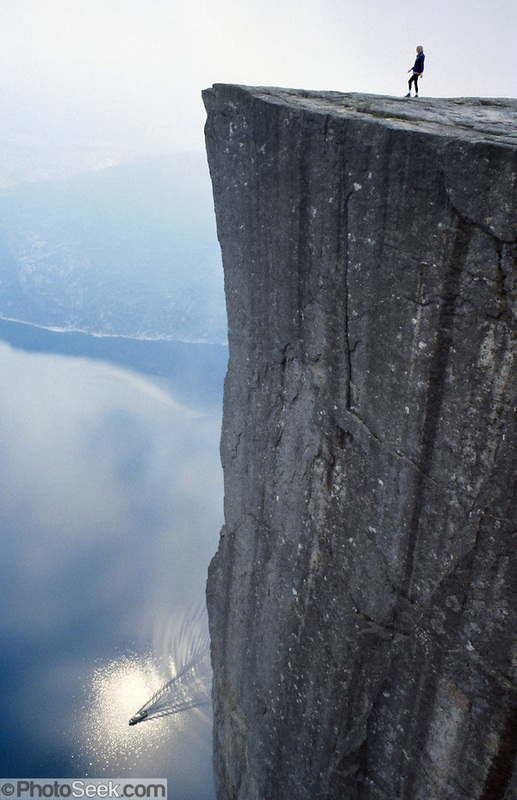 Tom Dempsey scanned this image from 35mm film that he shot in 1981 on an Olympus OM-1N camera: A solo hiker walks atop the Pulpit Rock (Prekestolen) 1959 feet above a car ferry on Lysefjord, Forsand municipality, Rogaland county, Ryfylke traditional district, Norway, Europe. Published in Wilderness Travel Catalog of Adventures 1998, 1996, 1988. Winner of “Honorable Mention, Photo Travel Division” in Photographic Society of America (PSA) Inter-Club Slide Competition May 1988. Published 2009 on a commercial web site in Amsterdam. 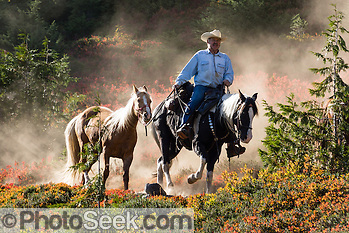 Published in “Light Travel: Photography on the Go” book by Tom Dempsey 2009, 2010. Plustek OpticFilm 8200i SE film scanner (2014). Epson Perfection V700 Photo Scanner with Digital ICE™ technology for dust spot removal, scans 12 slides at once in 8×10 inch area. 6400 dpi. Optical density 4.0 Dmax. Compatible with Windows XP and various Macintosh versions. Earlier excellent scanner: Epson Perfection 4990 Photo Scanner with Digital ICE™: This flatbed scans up to 8×10 inches, many images at once automatically. 4800 x 9600 dpi resolution, 48-bit color depth, and 4.0 Dmax (dynamic range). Compatible up to Windows XP, and various Macintosh versions. My discontinued Konica Minolta DiMAGE Scan Dual IV (used 2006−present) makes much better scans than my former Nikon LS-2000 (below), requiring little extra Photoshop adjustment [except for laborious manual dust removal required on 12/16-bit mode scans — where a workaround is to use Photoshop’s Filter>Dust & Scratches feature, but that often reduces image detail]. If you will be making lots of scans, get a different scanner that supports automatic dust removal using ICE or a similar infrared technology. Features: $240 in 2006; 3200dpi, or about 4284 by 2892 pixels from a scanned slide. Dynamic range higher than film, so it captures all shadow & highlight detail. This 3200 dpi resolution sufficiently captures all the clarity in 99% of my images taken on a tripod with consumer-quality SLR lenses. Photoshop can effectively enlarge using a bicubic algorithm. (I feel that 4000 dpi on a different scanner wouldn’t get any more useful information out of 99% of my film slide images). Universal USB connection. Unattended batch scan of 4 slides, each with custom settings. Requires Windows XP (which I run on a Notebook computer). Scanner doesn’t work with Windows Vista. 2700 ppi, makes ~2400×3600 pixels from slides, dynamic range=3.6, $1330 plus $430 stack loader; SCSI interface; can automatically batch scan 30 slides, all at the same setting. Using Nikon LS-2000 scanner, I have made prints 28×42 inches at 240dpi, which look good at a viewing distance of about 36 inches or further, scanned from Fujichrome Velvia slides (digitally enlarged from 2400×3600 pixels in two stages in Photoshop). By 2003, this Nikon LS-2000 workhorse was antiquated by cheaper, better scanners, but instead of upgrading to the Nikon LS-4000, I bought new digital cameras, which offer more flexibility, higher quality, much faster work flow, and scan subjects directly. The SCSI connection on the Nikon LS-2000 was incompatible with my Dell 9300 Notebook computer. I sold the LS-2000 scanner with stack loader (for $405 on e-Bay), and purchased the above superior Minolta scanner for only $240. Makes impressive prints (equal to or better than the typical chemical photographic process) up to 13 x 44 inches, rated at 80-year longevity on special Epson papers (when mounted behind glass). The 8-color Epson Stylus Photo 2400 prints on paper up to 13 x 44 inches and improves gray scale and dynamic range for blacks & shadows (essential for Black & White prints), using long lasting K3 inks, superior to the Epson 2200 or 1270/1280. The 8-color Epson Stylus Photo 3800 Printer (released 2007) prints on paper 17×22 inches using long lasting K3 inks. The 3800 takes up a surprisingly small footprint on your office desktop. Canon Pixma Pro-100 photo printer (new in 2013, with 8 color dye cartridges) makes economical, vibrant high-quality prints up to 13 x 19 inches, lasting about 30 years behind glass before fading. Canon Pixma Pro-10 printer (2013, with 10 color pigment cartridges). Epson SureColor P600 printer (2015, with 9 color Ultrachrome HD pigment cartridges, makes superior black & white prints, prints on thicker paper up to 1.3mm thick, supports roll paper, but costs $250 more plus 20% more per print). Weighs only 33 ounces (or 30 ounces without the center column) and is great for travel, superior to other travel tripods that I’ve evaluated (including Velbon MAXi343E, Manfrotto, or even Gitzo tripods costing three times more). To handle the weight of an SLR with lens weighing heavier than a pound, some photographers may prefer a more substantial change plate. Carry a penny or quarter to tightly screw lock the quick release plate securely to camera. Features: The stiff magnesium alloy legs are sufficiently stable for cameras up to 3 or 4 pounds (especially if you don’t extend the bottom leg section; or if you hang on extra weight) and have very fast locking levers (of sturdy plastic). This tripod rises to eye level (64 inches), collapses to 18 inches (or 16 inches if you remove the quick-release ball head). The metal ball head swings 90 degrees each way, to two vertical positions, and turns freely around, all tightened with one effective lever. Legs can optionally splay out independently in 3 locking positions down to 6.4 inches off the ground. For macro, the center column can be reversed underneath for great shooting flexibility at ground level, and unscrews into a short section (saving 3.3 ounces). (The convertible spike leg tips which I never used are now just rubber in the Pro II, saving a little weight and collecting less soil.) The earlier model “Pro” which I used for 2005-2008 was 3 ounces heavier than the Pro II after adding the superior quick change plate: Slik “Sprint Pro GM” Tripod ($90), with Manfrotto 3299 Quick Change Plate Adapter ($35, quick release), 36 ounces total. Stiff aluminum legs. Leg tips convert from spike (outdoor) to rubber (indoor use) with a simple lockable twist. Support Tom’s work — buy anything at Amazon.com . Panasonic Lumix DSC-ZS100 (buy at Amazon) (2016, 11 oz, 25-250mm equivalent lens) has an impressive 10x zoom on a 1″ sensor body which can fit in a large shirt pocket. The Panasonic ZS100 (read my review) is more versatile than my 3x zoom Sony RX100 III, which I sold in June 2018. Sony RX100 (read my review) version III pops up an electronic viewfinder (OLED SVGA 1.44M dots), widens its lens view to 24mm equiv (brightest aperture f/1.8), zooms to a sharper and brighter 70mm f/2.8 telephoto, tilts its 3″ LCD to a full 180 degrees and adds a Nuetral Density (ND) filter, all as substantial upgrades from version II. Sony RX100 (price at Amazon) has an impressive 1-inch-Type sensor (20mp), unusually fast 0.15 sec autofocus, and a sharp LCD (1,228,800 dots). To better grasp its slippery body, add a Sony AG-R2 attachment grip . Read my full review of Sony NEX-7 versus Nikon D5000 The NEX-7 was upgraded to Sony A6000 camera (at Amazon) in 2014. In 2016, A6000 upgraded to A6300 with more focus points. The reasonably sharp 11x zoom lens instantly frames rapidly-changing travel subjects without the extra bulk or annoyance of swapping lenses. Multi-coated filters: Tiffen 67mm Digital HT Ultra Clear filter & Tiffen 67mm Digital HT Circular Polarizer filter . Buy extra Wasabi Power NP-FW50 batteries for trekking. The Sony 18-200mm lens casts a shadow from 18-50mm using the NEX-7’s pop-up flash, which is fixable by mounting the taller Sony HVL-F20AM Digital Camera Flash . This Sony 18-200mm SEL18200 silver lens is sharper than the smaller 16-oz Sony SEL-18200LE black version (2012) and sharper than the respected Nikon AF-S DX 18-200mm VR II Zoom lens used on my previous Nikon D5000 camera. A slightly smaller Panasonic HD 14-140mm lens on Micro Four Thirds cameras matches sharpness of these lenses, but Sony 24mp APS-C sensor resolves more detail and dynamic range than Micro 4/3 sensors. I protect NEX-7 on-the-go in a Lowepro Toploader Zoom 50 AW Bag (mounted on a custom chest harness for hiking). Search for more camera bags at Amazon.com: preferably with instant access in front of you for hiking and traveling. Sima CapKeeper 2: Never lose your lens cap again! An elastic band slips securely around lens and extends a strong string which is adhered to your lens cap. When you uncap lens and drop the lens cap, the cap hangs from the lens string. Sony RX100 camera version I was the best pocket-sized camera of 2012. 28-100mm equiv lens, f/1.8-4.9, 20mp, 1-inch sensor, unusually fast hybrid autofocus (0.15 second), sharp LCD. Fits nicely in a Tamrac Digital 1 Photo Bag along with extra Wasabi Power NPBX1 batteries. HP Envy Phoenix H9SE-W8 Desktop PC with: 16 gb SDRAM DDR3 1600 MHz, Intel Core i7-3770K CPU 3.5 GHz, 3 TB SATA hard drive 7200 RPM plus ExpressCache HP 16GB Disk Cache SSD (for faster startup), 1.5 GB Nvidia GeForce GTX 660 graphics card, 600 watt power supply, and 64-bit Windows 8 operating system. LCD monitor: 24 inch Dell 2407WFP-HC Ultrasharp widescreen Flat Panel, 1920 x 1200 pixels, and 1000:1 Contrast Ratio. Canon PowerShot G9 was my wife’s main camera. 35-210mm equivalent lens, image stabilized. Disadvantages: Grainy at ISO 400 and too noisy at ISO 800+. Workaround: A Canon PowerShot G11 gives two stops ISO improvement, flip out LCD, 28-140mm lens, and DIGIC IV. The newer, smaller Sony DSC-RX100 camera effectively beats G9 real resolution from 35-150mm (by cropping RX100’s 20mp images where needed for digital telephoto) and has two stops lower noise at ISO 800+. But G9 is sharper for macro (albeit more distorted) and at telephoto 150-210mm equiv. G9 is a good 13-ounce camera with quality similar to an 8-megapixel DSLR of 2009 at ISO 80. Comparisons: The 28-140mm Canon PowerShot G10 has similar sharpness, making good 5×7 prints at ISO 400, with DIGIC III processor. A Canon A650 IS saves money with similar JPEG quality and adds flip-out LCD but no raw file support. The Nikon D5000 plus Nikon AF-S DX 18-200mm f/3.5-5.6G ED VR II Zoom is one of the best photo systems of 2009 for active travelers, sufficiently lightweight to carry all day in a chest bag. 23 ounce body with battery & strap. Mount with 22-ounce Nikon DX 18-200mm VR II Zoom (with cap and hood) with up to 4 stops image-stabilization (up to 8 times slower hand-held shutter speed). 12 megapixels 4288 by 2848 pixels, makes good prints to 23 by 30 inches or larger. Excellent quality to ISO 1600, and ISO 3200 is usable for smaller prints. Image quality similar to higher priced Nikon D300. CCD sensor size is Nikon DX format 23.6 x 15.8 mm. 2.7 inch tilt and swivel LCD (new, unusual for a DSLR) with rudimentary live view which focuses very slowly, as with all DLSRs through 2010 — focusing through viewfinder is much faster. Captures movies with monophonic sound. I protected the camera in a Clik Elite Large SLR Chest Pack This chest pack fits SLR camera with a lens up to 5.5 inches. Test the fit thoroughly within the store’s return period. The straps may work better for someone with larger-than-average shoulders. The upper shoulder pads are comfy, but the wide back pocket built into the back straps sorely rubbed into my left shoulder blade. I fixed by cutting away the lower back straps 2 inches below the V shape and resewing the two nicely padded upper shoulder straps to the lower part of a tested older harness. 20 ounces / 560 grams without cap and hood, new in 2006 (with version I of VR Vibration Reduction). 18-200mm focal length 11x zoom is perfect for travel (with 27-300mm equivalent field of view in terms of 35mm film). Minimizing lens swapping saves time, reduces dust spots on sensor, and promotes creativity. Hand hold shots in up to 4-stops dimmer light using Vibration Reduction (VR). Reduced tripod setup cuts shooting time in half, increasing creativity. Using the image-stabilized lens combined with good image quality on the Nikon D5000 up to ISO 1600 (even ISO 3200 is useful now) improves hand-held photography by about 1-2 stops compared to Nikon D60 (2008) and 6-8 f/stops compared to Canon Powershot Pro1 (2004) which shot noisy images above ISO 100. Focuses to 18 inches (0.5 meters) throughout the zoom range. Largest magnification is at 200mm telephoto closeup: 3.5 inches wide (or an area of 93 x 62 mm). Tiffen P ND .6 Graduated Nuetral Density Filter for balancing bright sky with foreground subjects. For speed, I hold this “neutral density graduated filter” up to the lens manually without a holder. How to optimize lens quality: By being so versatile, this Nikkor 18-200mm VR lens does suffer from some quality compromises, so I sharpen results from 70mm to 200mm by shooting from f/8 to f/11. At 135mm, its fuzziest zoom setting, use f/11 to f/16 for sharper results. When shooting flash with this 3.9″ lens, shoot above 24mm and remove the lens hood, or else a lens shadow will appear in the bottom of the image. Or mount a high flash on the hotshoe such as Nikon Speedlight SB-600 or 700. With VR set ON, I can sharply hand hold shots as slow as 1/8 to 1/30th second for respectively 18mm to 200mm. Caveats for the Nikkor VR 18-200mm lens: Architectural photographers (who need straight lines) won’t like the barrel distortion at 18mm wideangle (hard to correct for this lens), or the pincushion distortion between 35mm and 70mm (easily correctable using Adobe Photoshop>Filter>Distort>Lens Correction). Macro photographers should get a sharper dedicated macro lens or use a compact camera which focuses closely with great depth of field. inconveniently flip a switch on the Tamron. 26 ounces; 5.6″ length; 4.9 foot minimum focus; also compatible with full frame Nikon D3 DSLR. For sports, wildlife and birder photographers. According to testing by www.photozone.de, the Nikon 70-300mm captures about 5 to 20% sharper resolution than the Nikon 18-200mm VR. This lens proved its worth on our wildlife trip to Galapagos Islands and Ecuador in 2009. Unfortunately this 70-300mm lens cannot focus closer than 4.9 feet. For travel, consider carrying the Nikkor 70-300mm VR lens together with kit lens Nikkor 18-55mm 1:3.5-5.6G DX AF-S VR (with good closest macro area 63 x 42 mm), or with the 18-200mm VR II lens (93 x 62mm closest macro area). Hoodskins (800-818-3946): Protect your LCD from scratches by applying this clear plastic film, and preserve the resale value of your camera. Hoodskins Model HSK-4 for 3.5- to 4-inch LCD screens can be cut with scissors to fit smaller LCDs. Wireless remote control transmitter for shutter release: Nikon ML-L3 ($18) is important for any tripod photography (city lights, fireworks). Canon PowerShot S95 is half the size and half as sharp as a Canon PowerShot G9. Fits handily in a shirt pocket for people shots. 10 megapixels. 28-105mm equivalent lens, f/2-4.9. 1/1.7″ type sensor (7.44 x 5.58 mm). Good close-focus flower shots with deep depth of field, better than the closest focus of Nikon 18-200mm VR II lens on Nikon D5000. Upgrade: Canon PowerShot S110 camera , or superior Sony DSC-RX100 camera (twice as sharp with much faster focus). 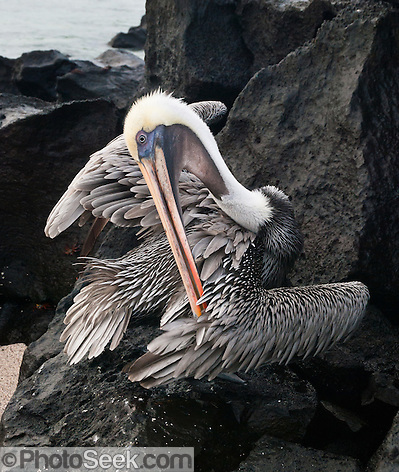 Photographed using a Nikon D60 DSLR using 18-200mm lens (© 2009 Tom Dempsey): A Galapagos Brown Pelican (Pelecanus occidentalis, subspecies: urinator) preens feathers at Suaraz Point, a wet landing on Española (Hood) Island, Galapagos Islands, Ecuador, South America. Published in “Light Travel: Photography on the Go” book by Tom Dempsey 2009, 2010. The Nikon D60 or D40X plus all-in-one 18-200mm VR lens is a great system for active travelers, sufficiently lightweight to carry all day in my chest bag. D60 or D40X camera body weighs 18 ounces (including battery & strap). The Nikkor AF-S DX VR 18-200mm 3.5-5.6G IF-ED lens weighs 22 ounces with cap and hood (released in 2006, adopted by me in 2008). Its wonderful new VR (Vibration Reduction) feature stabilizes the sharpness of hand-held shots by up to 4 stops of shutter speed − remarkably unchaining travel photographers from the constraints of a tripod! This D60 or D40X with 18-200mm lens system is comparable to Canon Rebel XSi with Canon 18-200mm IS. The D60 thankfully introduces a good sensor dust-removal system, plus VR kit lenses. (The previous Nikon D40X model, which I used from May 2007 to August 2008, required tedious dust spot corrections, but nowhere near as bad as slide film). The D60 introduces Active D-Lighting to attractively lighten shadow detail in JPEG shots, but Active D-Lighting doesn’t affect my raw shots — RAW gives superior editing leeway, so I generally avoid shooting JPEG (now that memory cards are getting cheaper than in the near past, allowing plenty of room for the larger RAW files). D60/D40X sensor captures 10 megapixels = 3872 x 2592 pixels, making good prints to 23 by 30 inches or larger. Excellent quality to ISO 800, and ISO 1600 is usable for smaller prints. Same image quality as the higher priced Nikon D200. CCD sensor size is 23.6 x 15.8 mm (six times the light gathering area of the sensor in my earlier compact Canon Pro1). The Nikon D60/D40X has a bright 2.5 inch LCD and shoots a generous 300 to 420 images per charge (using a Digital Concepts 1200 mAh battery, at 40 to 70 degrees F, using the LCD briefly on most shots; most shots using VR and 10% using flash). The batteries last 2.5 times longer than Canon Pro1 batteries and weigh an ounce less per battery. Long battery life is important for trekking away from electricity such as in Nepal, where six batteries lasted for two weeks shooting 2800 images without recharging on the D40X. Adobe Lightroom version 1.1 introduced support for the Nikon D40X camera, and version 1.4 supported Nikon D60. 2008-09: my wife uses the shirt-pocket sized Canon SD700 IS (below), which serves as my backup that adds movies & sound recording. This amazingly tiny and lightweight camera can be carried in your pocket, takes still shots with publication quality up to 12 by 16 inches, and serves as a main camera for my wife and backup camera for me. Features: 6 megapixels (2816 x 2112 pixels). Image-stabilized zoom lens 5.8-23.2 mm, f/2.8-5.5 (or 35-140 mm lens in 35mm-film-camera terms); 0.79-inch macro focus. Movies can be 15, 30 or 60 frames per second, with dynamic exposure and digital zoom as you shoot, which is better than the Pro1. Great DIGIC II processor. We bought the optional housing for shooting underwater. Disadvantages: No raw file mode. It has good exposure +/- compensation, but cannot set or view the F/stop aperture or shutter speed (except shutter speed thankfully displays live when the camera shake warning also displays). The SD700 was succeeded by the SD850. Excellent alternatives to the SD700 IS: Sony Cyber-shot DSC-N2; or Canon SD800 IS ELPH. Slightly larger, higher quality alternatives in 2007: Canon PowerShot A710 IS, or PowerShot G7. Upgrades released in 2008: G9, G10. 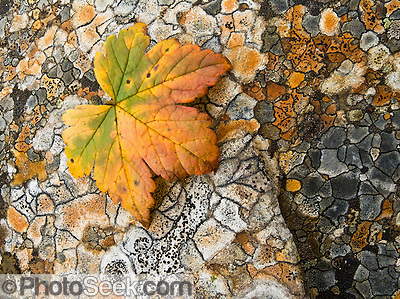 Photographed using a compact Canon PowerShot Pro1 camera (© 2006 Tom Dempsey): An orange and green leaf rests on polygons of orange and gray lichen in Denali State Park, Alaska, USA. 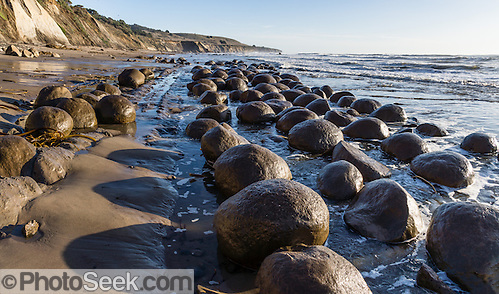 Published in “Light Travel: Photography on the Go” by Tom Dempsey 2009, 2010. For its time, the Canon PowerShot Pro1 was a great all-in-one camera for traveling. Features: 8 megapixels = 3264 x 2448, makes good prints to 23 by 30 inches. Professional “L series” 7.2-50.8 mm zoom lens, with fast f/2.4-3.5 widest aperture, or 28-200 mm, in terms of 35mm-wide-film cameras (horizontal angle of view from 65.5 degrees wide, to 10.3 degrees at telephoto). Close macro focus to 1 inch (using 5 megapixel Super Macro, f/3.0 at 90 mm). The electronic viewfinder EVF is great when the LCD is hard to read in bright sunlight. High resolution Movies. JPEG images require little Photoshop touch up; and the raw format preserves superior image quality. Battery life is half of the earlier Canon G5, so I carry a few more batteries. CCD sensor 2/3 inch type (8.8 x 6.6 mm). Using the Pro1’s wide angle lens at maximum f/8, everything is in focus from 1.4 feet to infinity when you focus at 2.7 feet (the “hyperfocal point”; all objects at distances from half of the hyperfocal distance out to infinity will be acceptably sharp). Using the Pro1’s 50.8 mm telephoto at f/8, if you focus 132 feet away, then everything is in focus from 66 feet to infinity; and focusing the same telephoto at 20 feet, you get 6 feet of total depth of field from front to back. April 2005 upgrade: Canon Pro1 Firmware version 1.0.1.0 (free on Canon Support Web Site, released December 2004) doubles the shutter release speed, reducing shutter lag from about 0.6 to 0.3 seconds. But in 2007, the discontinued Canon Pro1 was outclassed by the more capable Fujifilm FinePix S9100, which is the same weight but physically larger. This tiny and lightweight camera can be carried in a pocket, takes still shots with publication quality up to 12 by 16 inches, and served as a main camera for my wife and backup camera for me for 1.5 years. Features: 7 megapixels = 3072 x 2304 pixels. Zoom lens 7.7-23.1 mm, f/2.8-7.1 Wide, f/4.9-13.0 Telephoto (or 37-111 mm lens in 35mm-film-camera terms); 2-inch macro focus. Movies can be 15, 30 or 60 frames per second, and now with dynamic exposure and digital zoom as you shoot, which is better than my Pro1. Great DIGIC II processor. Drawbacks: No raw file mode. Has good exposure +/- compensation, but cannot set or view the F-stop aperture or shutter speed. To maximize depth of field, set the SD500 mode dial to Manual and toggle the Infinity button (until you see the mountain symbol). Using the SD500’s 7.7 mm (37 mm equivalent) wide angle lens at maximum f/7.1, everything is in focus from 2.3 feet to infinity when you focus at 4.6 feet (the “hyperfocal point”). At the 23.1 mm (111 mm equivalent) telephoto maximum f/13, everything is in focus from 11.5 feet to infinity when you focus at 23 feet. We bought the SD500 for $450 in May 2006, and sold it on e-Bay 1.5 years later. In October 2006, we upgraded to the well-reviewed Canon PowerShot SD700 IS ELPH above (which introduces excellent image stabilization in a longer zoom 35-140 mm f/2.8-5.5 lens, which helps compensate for the lower resolution of 6 megapixels; and shutter-button lag is now reduced to a very fast 0.1 to 0.3 seconds). FILM VERSUS DIGITAL (read my 2009 article). While film can fade, high-quality digital image file formats should last perfectly into the future so long as you copy backups onto the latest storage media which are readable by up-to-date software. To avoid unrecoverable exposure problems and posterization, always record 12-bit (or 14-bit) camera raw format files at shooting time to create digital archive files that have 16 (or 64) times the tonal editing headroom compared to JPEG (which has only 8 bits per pixel per red, green, or blue color channel). If your editing software ever threatens to evolve beyond compatibility with older raw files (which are proprietary to each camera), first convert to a modern “universal” raw format such as Adobe Digital Negative, DNG files, to ensure future compatibility. As of 2015, Adobe Lightroom version 6 still handles my oldest raw files from Canon Powershot G5 camera of 2003, and I haven’t yet seen the need to convert old files to DNG. For secure backup of my Lightroom edits, I like “Automatically write changes into XMP” (Lightroom > Edit > Catalog Settings > Metadata), in case the Lightroom catalog ever becomes corrupted and must be restored by re-importing raw image files + sidecar XMP files. 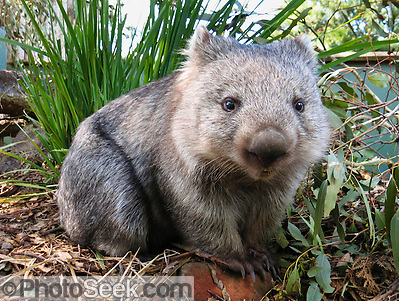 A flip-out-and-twist LCD allowed me to lower my Canon PowerShot G5 camera into the enclosure to frame at wombat level, with permission at Bonorong Wildlife Park, Tasmania, Australia. (© Tom Dempsey) Published on Australian geocaching coin 2010; displayed in support of Wilder Foundation 2009, 2010; and exhibited at Oceanario de Lisboa, Portugal 2007. Published in “Light Travel: Photography on the Go” book by Tom Dempsey 2009, 2010. The Canon PowerShot G5 convinced me to stop shooting film! The G5 was half the size and weight of my earlier Nikon N70 SLR outfit (below), yet had a brighter lens, and rivaled the quality I got from scanning film using the Nikon LS-2000 film scanner (which was later superseded by better scanners). G5 Features: 5 megapixels = 2592 x 1944, 35-140 mm zoom (equivalent), f/2.0-3.0, + fixed 245 mm or 1.75x attachment lens. Its great flip-out-and-twist LCD became a critical feature that I never knew I needed before, for macro, wildlife, and people shots. is more realistic and not quite as vivid as Velvia 50, but has twice the speed, and could have become my new mainstay film, except for the superiority of a digital camera for my travel and nature photography. This classic film became my new mainstay, until I switched to a digital camera in 2004. 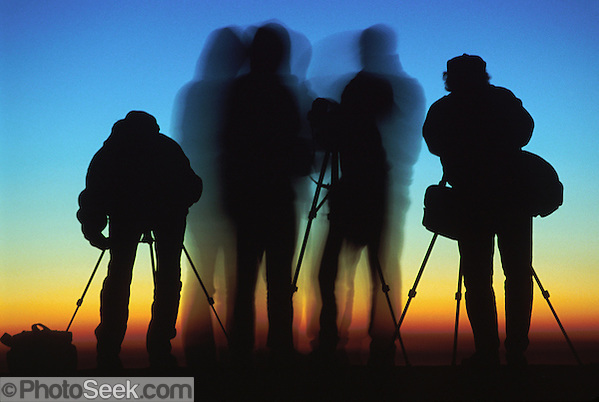 Silhouettes of four photographers at sunrise on Mount Nemrut, in the Republic of Turkey. (© 1999 Tom Dempsey) Published in “Light Travel: Photography on the Go” book by Tom Dempsey 2009, 2010. Doubled light gathering power and gained a nice built-in flash, at the cost of slightly more bulk and weight. Fully automatic + manual. In April 1999, I upgraded lenses to: Sigma 28-105 mm f/2.8-4 Aspherical Zoom; and Sigma 70-210 mm f/3.5-4.5 APO Telephoto Zoom Macro (2:1 magnification). Nikon N70 was released in 1996. 2.9 pounds with lightweight ballhead, plus Kirk quick release plate. When the camera is not attached, the Kirk plate can lose its release knob unless you screw it all the way down, which partly defeats the quick release purpose. The screw-locking legs on this Gitzo model are very slow to set up and take down, and the small ball head constantly came unscrewed (a design flaw). I upgraded to a lighter, faster & cheaper yet equally sturdy tripod further above. became my new mainstay: fast & sharp with adequate color. but I was usually unhappy with the grainy results. which is faster than Kodachrome 25, but color is not as vivid. was my longtime mainstay film with good sharp results. Even though it is one of the longest-lasting films, some of my Kodachrome 25 slide images are fading after 25 years. Ektachrome fades quicker than Kodachrome. 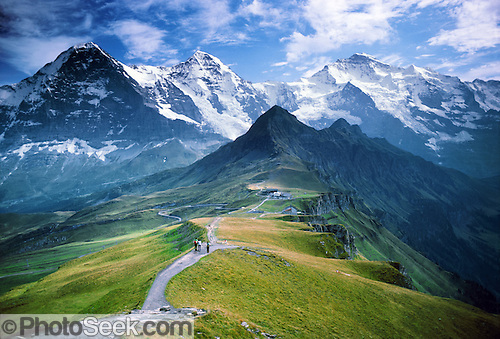 I photographed this popular image on a Olympus OM-1N SLR 35mm-film camera (© 1981 Tom Dempsey): From Männlichen Gipfel see the peaks of Eiger (Ogre 13,026 feet on left), Mönch (Monk), and Jungfrau (Virgin 13,600 feet on right) in the Berner Oberland, Switzerland, the Alps, Europe. Published multiple times and even featured in a Swiss movie by Meret Nora Burger. Trusty and rugged. Fully manual camera. Attachable flash. I started with fixed 50 mm and 135 mm Zuiko lenses, then upgraded to a Tamron 28-70 mm f/4 zoom, and a Sigma UC II 70-210mm, f/4-5.6, 1:4.7 macro, telephoto zoom lens. From 1978 to 1997, I used lightweight SLIK 500G and other tripods for travel. The OM-1 can take 8-hour night sky star-trail photographs, which can require special battery supplements on modern battery-intensive cameras, such as the Nikon N70 film camera, and especially digital cameras. with splash-proof M.ZUIKO DIGITAL ED 12-50mm f/3.5-6.3 EZ lens (24-100mm equiv, 7.5 oz, with splendid video, macro down to 36×27 mm). oz = ounces. Above camera weights in ounces (oz) include battery and memory card. g = grams. Multiple ounces by 28.35 to get grams. mm = millimeters. A centimeter (cm) equals 10 millimeters. Multiply centimeters (cm) by 0.3937 to get inches. DSLR = Digital Single Lens Reflex = a traditional camera where an optical viewfinder uses a mirror to see through the interchangeable lens. LCD = Liquid Crystal Display. OLED (Organic Light-Emitting Diode) beats an LCD in dynamic range from darkest to brightest and consumes less power. LPH or LPPH = resolvable lines per picture height = the best empirical measure of real resolution of a camera’s sensor for a given lens (independent of pixel pitch or megapixel count). A camera with higher LPH can make sharper large prints. Look up cameras on dpreview.com to find absolute vertical LPH judged by photographing a PIMA/ISO 12233 camera resolution test chart under standardized lighting conditions. Note which lens, settings, and camera body was used in each test, and compare with others within the same web site. “equivalent“ lens = To compare lenses on cameras having different sensor sizes, equiv or equivalent lens refers to what would be the lens focal length (measured in mm or millimeters) that would give the same angle of view on a “full frame” 35mm-size sensor (or 35mm film camera, using 135 film cartridge). “Crop factor” = how many times smaller is the diagonal measurement of a small sensor than a “full frame” 35-mm size sensor. For example, the 1.5x crop factor for Nikon DX format (APS-C size sensor) makes a lens labeled 18-200mm to be equivalent in angle of view to a 27-300mm focal length lens used on a 35mm film camera. The 2x crop factor for Micro Four Thirds sensors makes a lens labeled 14-140mm to be equivalent in angle of view to a 28-280mm lens used on a 35mm film camera. In 2013, superzoom often refers to lenses of about 15x zoom range or larger. Steady quality improvements in the resolving power of sensors has made possible superzoom cameras in ever smaller sizes. As superzoom range increases, laws of physics require lenses to focus upon smaller sensors (light detectors) or else to increase lens size. For a given level (most recent year) of technological advancement, a camera with physically larger sensor (bigger light detecting area) should capture better quality for a given zoom lens range. “10x zoom” = zoom lens telephoto divided by wide angle focal length. For example, a 14-140mm focal length zoom has a 10x zoom range (140 divided by 14). An 18-200mm zoom has an 11x zoom range (200 divided by 18). “equivalent” F-stop = refers to the F-stop (F-number) on a full-frame-sensor camera which has the same hole diameter as the F-stop of the camera lens being compared. The concept of “equivalent” F-stop lets you compare capabilities for creating shallow depth of field on cameras with different-size sensors. Smaller-sensor cameras use shorter focal lengths for the same field of view, so at a given F-stop they have a smaller physical aperture size, meaning more depth of field (with less blur in front of and behind the focused subject). Formula: F Number (or Relative Aperture) = actual focal length of lens divided by diameter of the entrance pupil. Support Tom’s work — buy any number of items at any Amazon.com link here on PhotoSeek. Top recommended travel cameras (smartphone, pocketsize, midsize, DSLR, full frame) as of March 2019. PART A: SMARTPHONES compensate for tiny cameras via computation, but zoom poorly and can struggle in dim light. Top phones include Samsung Galaxy S9+, Google Pixel 3 and Apple iPhone. PART B: Sharper prints can be made from the top POCKETSIZE CAMERA (read my RX100M6 review), the 8x zoom Sony RX100 VI (price at Amazon) with 1-inch Type sensor. Or save 55% using a good Panasonic ZS100. Save 30% off that with smaller-sensor, versatile Panasonic ZS70 with viewfinder. Save 50% off that with basic Canon PowerShot ELPH 190 IS without viewfinder. PART C: For publishing, I prefer this MIDSIZE CAMERA: 37-ounce Sony RX10 IV (Amazon) with versatile 25x zoom lens which outshines APS-C sensor systems anywhere near its weight. 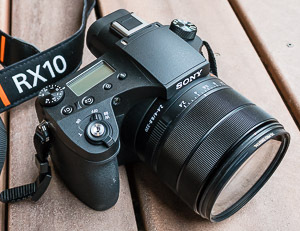 Read my RX10M4 review. Much cheaper, a crisp 16x-zoom Panasonic FZ1000 (29 oz) beats the bulk & cost of DSLR systems; and FZ1000 II is worth the upgrade price (for new lower-noise sensor and sharper LCD screen & EVF). PART D: Traditionalists wanting an optical viewfinder, more lens choices, and night photography may pick a bulkier DSLR-STYLE CAMERA with APS-C sensor. A good-value 32-ounce DSLR travel system is Nikon D3500 mounted with 19x zoom Tamron 16-300mm f/3.5-6.3 Di II VC lens (but edges are not as sharp as Sony RX10 IV). PART E: Much pricier and heavier FULL-FRAME SENSOR CAMERAS may attract elite photographers seeking indoor or night images at high ISO 6400+. With its digital sensor size matching legacy 35mm film, Sony Alpha A7 II is a good value. The world’s most versatile midsize camera: Sony RX10 IV or III has a dust-sealed 25x zoom 24-600mm equivalent, bright f/2.4-4 lens. Samsung Galaxy (unlocked, shop at Amazon): Note9 with 512GB storage(Tom’s pick), S9+, Note8, S8, S7 and S6 all have amazing cameras. Apple iPhone (unlocked) versions XS Max, XS, X, 8 Plus, and 7 Plus. “Unlocked” lets you pick a lower-priced wireless service provider. Outside your home country, eliminate roaming charges via your phone’s “WiFi Calling” feature; or buy a cheap SIM with generous data. To save money on your US wireless carrier, try my favorite: Consumer Cellular (external link), which uses the full AT&T network more cheaply, with top customer service. (Tell CC that Thomas Dempsey #102558526 referred you.) If cell reception is poor where WiFi is strong, turn on your phone’s “WiFi Calling”, which also works in most countries outside of USA when calling US phone numbers. Sony Cyber-shot DSC-RX100 VI (Amazon) (2018, 11 oz, 24–200mm f/2.8-4.5, RX100M6). Read my RX10M6 review. Avoid dropping its slippery body by adding Sony AG-R2 attachment grip. Fit into Tamrac Digital 1 Photo Bag with extra Wasabi Power NPBX1 batteries. Avoid LCD scratches with QIBOX Premium GLASS Protector to preserve resale. Yearly advances have now optimized zoom quality in portable travel cameras with a 1-inch Type sensor size (explained in my Sensors article). Panasonic Lumix DSC-ZS100 (2016, 11 oz, 25-250mm equivalent lens f/2.8-5.9). Read my ZS100 review. Panasonic Lumix DC-ZS200 (2018, 12 oz, 24-360mm equivalent lens f/3.3-6.4) outguns all pocketable 1″-sensor rivals with a versatile 15x zoom, but sibling ZS100 is sharper and brighter through 10x. Sony Cyber-shot DSC-RX100 versions IV, III, II, or I : within its limited 3x zoom is sharper and brighter than that sub-range of Panasonic’s 10x-zoom ZS100. Save money with used or earlier III, II or I versions — read Tom’s Sony RX100 III review. Best value pocketable superzoom: Panasonic Lumix DMC-ZS70 (2017, 11.4 oz, 24–720mm equiv 30x zoom, 20mp, Electronic ViewFinder/EVF). Or save on older ZS60 . Cheaper 10x zoom: Canon PowerShot ELPH 190 IS (2016, 5 oz, 24-240mm equivalent, 1/2.3″ sensor, but no viewfinder). Underwater, shockproof, dust-resistant: Olympus Tough TG-5 (2018, 9 oz, 25-100mm, f/2.0-4.9 lens) compromises image quality but makes nice underwater movies. TIP: As a workaround for sluggish autofocus (AF) in cheaper compact cameras: prefocus (lock) on a contrasty edge of the subject by half pressing and holding the shutter button, then the subsequent full press will be instant, ≤ 0.15 second. But half-press autofocus lock doesn’t work in continuous focus or action modes. Don’t let an inferior camera frustrate your capture of action, people, pets, or sports. For surer action shots, consider a newer model with hybrid AF such as pocketsize Panasonic ZS100, Sony RX100, or midsize RX10 or Panasonic FZ1000 or interchangeable-lens camera. Sony Cyber-shot DSC-RX10 IV packs the ultimate all-in-one travel tool into 37 ounces — read my RX10M4 review. Its dust-sealed, bright f/2.4-4 lens with remarkable 25x zoom is sharp across the frame from 24-600mm equivalent, well into birding territory (read my Telephoto article). With the latest 1”-Type sensor, it captures great depth-of-field details, everywhere from close flower shots to distant bird feathers. Preserve your investment with B+W 72mm XS-Pro Clear MRC-Nano 007M Filter for the lens and Sony PCK-LM15 protective LCD cover. Extend shooting time with Wasabi Power NP-FW50 (1300mAh) batteries for Sony and SanDisk Extreme PRO 128GB UHS-I/U3 SDXC Flash Memory Card (Amazon). Sony Alpha A6300 mirrorless camera with 16-50mm lens (at Amazon) (2016, 14 oz + 4 oz 24-75mm equiv zoom, 24mp APS-C) has very Fast Hybrid Autofocus. Read my A6300 review. Sony PCKLM17 LCD Screen Protect Semi-Hard Sheet fits A6000, A6300, A6500. If you don’t need a viewfinder, a cheaper Sony A5100 (at Amazon) adds touchscreen and autofocuses as fast as the good-value A6000 (read article). Best midsize camera for the money: Panasonic FZ1000 (2014, 29 oz with fast-focusing 16x zoom lens 25-400mm equiv, bright f/2.8-4, 20mp, 1″-Type BSI sensor) rivals the zoom quality of APS-C-sensor and DSLR systems of this weight, for a cheaper price. The FZ1000 version II (2019, 28.5 oz) is worth the upgrade price for new lower-noise sensor and sharper LCD screen & EVF. Panasonic Lumix FZ300 (2015, 24.4 oz, 12 mp, bright f/2.8 lens 25-600mm equivalent, 24x zoom range, weather sealed). Nikon Coolpix P900 (2015, 32 oz, 16mp, 24–2000mm equivalent 83X zoom lens). GENERAL TIP: Upgrade your camera every 2 or 3 years as I do to get better real resolution, lower noise at higher ISO speeds ( ≥ 800), and quicker autofocus. Since 2009, most cameras take sharper hand-held shots using optical image stabilization (branded as Nikon VR, Canon IS, Panasonic OIS, Sigma OS, Tamron VC, Sony OSS). Today’s cameras capture much better highlight and shadow detail, by using better sensors plus automatic HDR (high dynamic range) imaging and other optimizations for JPEG files. On advanced models, I always edit raw format images to recover several stops of highlight and shadow detail which would be lost with JPEG. What makes an ideal travel camera? The “best” travel camera is the one you want to carry everywhere. The best Light Travel cameras (as chosen above) should minimize bulk and weight while maximizing sensor dimensions (read article), zoom range, lens diameter, battery life ( ≥ 350 shots), and ISO “sensitivity” (for lower noise in dim light). An optimally sharp zoom lens should change the angle of view by 8x to 25x to rapidly frame divergent subjects, without the extra bulk or annoyance of swapping lenses. Lenses should autofocus fast (with hybrid AF minimizing shutter lag ≤ 0.3 sec), optically stabilize images, and focus closely (for macro). Travel cameras should pop up a built-in flash and also flip out (articulate/hinge/swivel) a high-resolution display screen to jump-start your creative macro, movie, and candid shooting at arm’s length. OLED displays usually outshine LCD. Sunny-day reflections often obscure display-screen visibility − but to save bulk, most pocket cameras sadly lack a viewfinder. A camera with a brilliant electronic viewfinder (preferably an EVF with ≥ 1 million dots) gives better feedback on the final digital image than a non-digital optical viewfinder. Related camera history: Tom Dempsey’s travel cameras adopted from 1978 to now. Tamron 16-300mm f/3.5-6.3 Di II VC PZD MACRO lens (2014, 19 oz, 3 x 3.9″, 24-450mm equivalent) equals Nikon’s kit-lens quality (but Sony RX10 IV and III are sharper, especially at ≥90mm equivalent). Nikon AF-P Nikkor 70-300mm F4.5-5.6E ED VR (2017, 24 oz) takes sharper, faster-focusing shots of birds, wildlife, and sports. Upgrade: Nikon D5600 (2016, 16.4 oz body, 24mp) adds fully articulated (flip out) LCD touchscreen. Tokina 12-28mm f/4.0 AT-X Pro DX lens for Nikon (2013, 19 oz) is sharper than f/3.5-f/4 rivals. 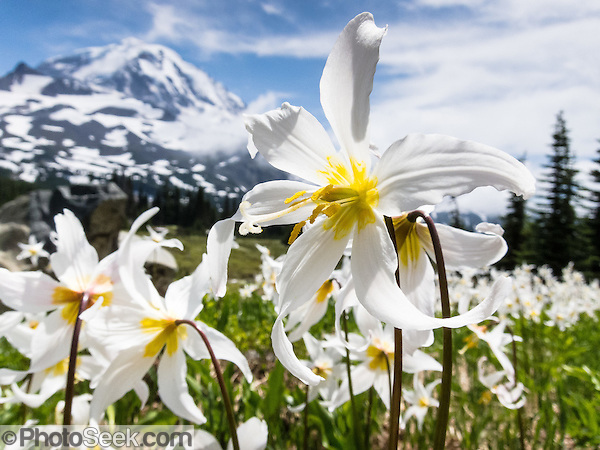 Tokina AT-X Pro 11-16mm f/2.8 DX II wide angle lens (2012, 19 oz) has sharper, faster, professional-level, pricier optics. Sigma 18-35mm f/1.8 DC HSM lens (2013, 28.5 oz, 3.1 x 4.8″, 27-52.5mm equivalent) is the world’s first zoom having a constant f/1.8 brightest aperture and is the sharpest wide-angle lens (including primes) as of 2014! Shoot this “Art” series lens sharpest at around f/2.8 throughout the zoom. Sigma DC lenses are optimized for cameras with APS-C size sensors. Sigma 150-600mm f/5-6.3 DG OS HSM Contemporary Lens for Nikon (2015, 68 ounces, 4.1 x 10.2 inches, best telephoto reach for the money). Tamron SP 150-600mm F/5-6.3 Di VC USD lens for Nikon (2014, 69 oz or 1951 grams, 4.2 x 10.2 inches). Sigma 120-300mm f/2.8 DG OS HSM for Nikon (2012, 120 ounces, 4.8 x 11.5″) unbeatable sharpness, bright f/2.8 zoom. Nikon AF-S Micro-Nikkor 60mm f/2.8G ED Macro Autofocus lens (15 oz) with fast SWM (Silent Wave Motor) and IF (Internal Focusing), captures true macro 1:1 reproduction ratio. Canon EF-S 60mm f/2.8 Macro USM lens for APS-C sensors (12 oz) captures true 1:1 reproduction ratio; for a Canon body. Compared to the above 60mm lenses, longer macro lenses such as 100mm and 105mm give you a few more inches of comfortable working distance from the front of the lens (to avoid startling insects) and can have a different bokeh (character of out-of-focus areas), but at the cost of larger size, weight, and expense. Instead of carrying one of the above prime macro lenses for a DSLR camera, consider carrying a pocket camera or smartphone which can focus very closely at wide angle with deep depth of field, and can serve as a backup for your larger/main camera. Better yet, don’t get a DSLR — instead, do everything well with 25x zoom Sony RX10 III or IV (Tom’s review; with best macro at 600mm f/5.6). Or a cheaper Panasonic ZS100 captures good close focus shots at 45mm equivalent after Macro/Flower symbol button is pressed. Historical DSLR comparison: Nikon D3300 offers more for your money (at a lighter travel weight) than Canon EOS Rebel cameras of 2014 and earlier. Also, the earlier Nikon D3200 beats Canon Rebel DSLR cameras of 2012. The best mirrorless designs can pack more quality into a smaller box, but DSLR cameras offer more specialty lenses, with a design legacy inherited from the 35mm film era, where an optical viewfinder’s mirror box adds bulk. Full-frame-sensor cameras excel at indoor, night, and very-large-print photography, but require bulkier lenses, often with limited zoom ranges. Full-frame sensors can resolve more detail with less noise in dim light at high ISO 3200+ when compared to APS-C and smaller sensors of a given year. The lightest-weight, best-price-value, full frame-sensor camera is Sony Alpha A7 Mirrorless camera (17 oz body, 24mp, 2013), or Sony Alpha A7 II (2014, 21 oz), or newer Sony A7R II . The A7 series requires Sony FE (full frame) E-mount lenses. The A7R (2014, 16.4 oz) captures 36mp. In contrast, A7S (2015, 17 oz) has 12mp optimized with large photosites and more sensitive autofocus great for low-light videographers, but its stills require ISO 12,800+ to beat A7R’s 36mp image quality. Instead of having an optical viewfinder like a DSLR, the A7, A7II, A7R, and A7S have a great electronic viewfinder (EVF) with 2.4 million dots (XGA). The 3-inch tilting LCD has 1.23 million dots (except 921,000 on A7S). New Hybrid AF builds phase-detection autofocus into the sensor, capturing 5 fps with continuous autofocus. With contrast-detection autofocus only, A7S shoots 5 fps and A7R shoots 4 fps. Weatherproof bodies. As an alternative, Sony Cyber-Shot DSC-RX1 full frame compact camera (17 oz with 35mm f/2 fixed-lens, non-interchangeable, 24mp, 2012) fits in a coat pocket; but the optical viewfinder/rangefinder is a costly add-on. Shooting as high as ISO 25,000 still captures usable pictures. Nikon D750 DSLR camera (26.5 oz body, 24mp, 2014) is excellent. 6.5 fps continuous shooting. Tilting 3.2″ RGBW LCD screen has 1.23 million dots. Long 1230 shots CIPA battery life. Uses Full frame Nikon F Mount/FX Format lenses. Nikon D810 DSLR camera (big 35 oz body, 36mp, 2014) camera demands highest quality full frame Nikon F Mount/FX format lenses and excites professional studio and landscape photographers with its very high resolution (3200 lph raw for D800 and better in D810) rivaling the quality of medium format film for making big fine-art prints. In dim light at dusk, dawn, or indoors, capture low-noise images at high ISOs 6400 to 12,800 — even ISO 25,600 can look good in small prints. Capture unprecedented dynamic range in raw files from bright to dark. Unfortunately it has very slow autofocus using LCD Live View (fixed by using mirrorless Sony A7). Frames per second at full res FX mode has increased to 5 fps for sports (versus 4 fps in D800, or 6 fps if DX frame size). Nikon D610 DSLR camera (30 oz body, 24 mp, 2013) costs less than D800. Captures less noise than Sony NEX-7 by 2-3 stops of ISO when set at ≥3200. Raw resolution up to 2800 lph. Buy extra Wasabi Power brand batteries (from Blue Nook / Amazon.com). Portable Charger Battery Pack: Mi Premium Power Bank Pro 10000mAh, 18W Fast Charging Slim. Great for travelling away from electrical outlets! It efficiently powers a phone 40% longer than rival Anker PowerCore 10000, says PCMag. It thankfully supports pass-through charging of itself AND your device at the same time. Fits most phones; includes USB-C adapter cable. SanDisk Extreme PRO 128GB UHS-I/U3 SDXC Flash Memory Card (buy at Amazon) fits weeks of shooting, great for 4K video. Or cheaper: SanDisk 16GB Extreme SDHC Memory Card . A clear glass filter protects precious lenses from scratches & catastrophic drops. I speak from experience! Get a clear glass filter, NOT a UV filter, which modern multi-coated lenses have made redundant. Example: high quality B+W 72mm XS-Pro Clear MRC-Nano 007M Filter fits my Sony RX10 III (read article). Mount a circular polarizing filter (B+W brand at Amazon) only to remove reflections or haze, or to contrast clouds with polarized sky. Don’t forget to immediately take it off for all other conditions, as it can block 1-1.5 stops of light. 2x Cactus Wireless Flash Transceiver Duo triggers your flash or camera wirelessly at distances up to 328 feet. Critical editing & organizing software: Adobe Creative Cloud Photography plan (Lightroom Classic CC 7.x and Photoshop CC) speeds modification (non-destructively), editing, sorting, and labeling of images. Lightroom version 6 added Photo Merge to Panorama and HDR. In 2016, Lightroom CC subscription added Boundary Warp essential for stitching panoramas quicker, and Dehaze to remove haze in skies & glass, as a leap beyond Clarity. (Adobe Photoshop software lets advanced users manipulate complex Layers such as for printing, or CMYK color space for publishing.) If your Lightroom CC subscription expires, you can still view, organize and export (but not Develop) images. Free editor for stitching panoramas from multiple overlapping images: Image Composite Editor (ICE) (from Microsoft Research Computational Photography Group) was faster and sharper than my old Photoshop CS5. Canon Pixma Pro-100 photo printer (new in 2013, with 8 color dye cartridges) makes economical, vibrant high-quality prints up to 13 x 19 inches, lasting about 30 years behind glass before fading. But the following pigment inkjet printers make longer-lasting prints: Canon Pixma Pro-10 printer (2013, with 10 color pigment cartridges) and Epson SureColor P600 printer (2015, with 9 color Ultrachrome HD pigment cartridges, makes superior black & white prints, prints on thicker paper up to 1.3mm thick, supports roll paper, but costs $250 more plus 20% more per print). Tamrac digital camera bag protects your precious device on the road. Slik “Sprint Pro II GM” Tripod has a built-in quick-change plate, good for small cameras. Plustek OpticFilm 8200i SE scanner (2014) reincarnates your slides & film digitally, with important infrared/ICE removal of dust & scratches. Weather & dust protection: Prudent bagging can avoid the extra expense of a weather-sealed body & lens – keep a camera handy, safely in a front pouch on your chest or hip (where it can be retrieved more quickly than from a pack on your back). Adverse fluctuations of temperature & humidity, or dusty conditions, or sea spray all require cameras to be double-protected in a zip-lock plastic bag inside the padded pouch. Use a soft, absorbent silk cloth to wipe away moisture or dust from lens & body before bagging. Cold batteries: Using camera batteries below 40 degrees Fahrenheit (or 4 Celsius) loses their charge quicker, causing camera shut down or lock. Revive and extend battery life in cold or below-freezing weather by warming an extra battery or two in an interior pocket near your skin and swapping with the camera’s battery after every 5-10 minutes of cold exposure. Satellite communication: Stay in touch everywhere in the world via Iridium satellite with DeLorme inReach Explorer (7 oz; buy at Amazon) : send and receive 160-character text messages with GPS coordinates (accurate to five meters) to cell numbers or email addresses worldwide and post updates to social media. This new, affordable technology connects campers, hikers, hunters, backpackers, alpinists, and backcountry skiers who often venture outside of cell phone networks. The portable 7-ounce device includes a color-coded map with waypoints, elevation readings, current speed, average moving speed, and compass. Also, you can trigger an SOS, receive delivery confirmation, and communicate with DeLorme’s 24/7 search-and-rescue monitoring center. In 2013, “superzoom” referred to lenses of about 15x zoom range or larger. Steady quality improvements in the resolving power of sensors has made possible superzoom cameras in ever smaller sizes. As superzoom range increases, laws of physics require lenses to focus upon smaller sensors (light detectors) or else to increase lens size. For a given level (most recent year) of technological advancement, a camera with physically larger sensor (bigger light detecting area) should capture better quality for a given zoom lens range. Support Tom’s work — buy any number of items after clicking any Amazon.com links above. 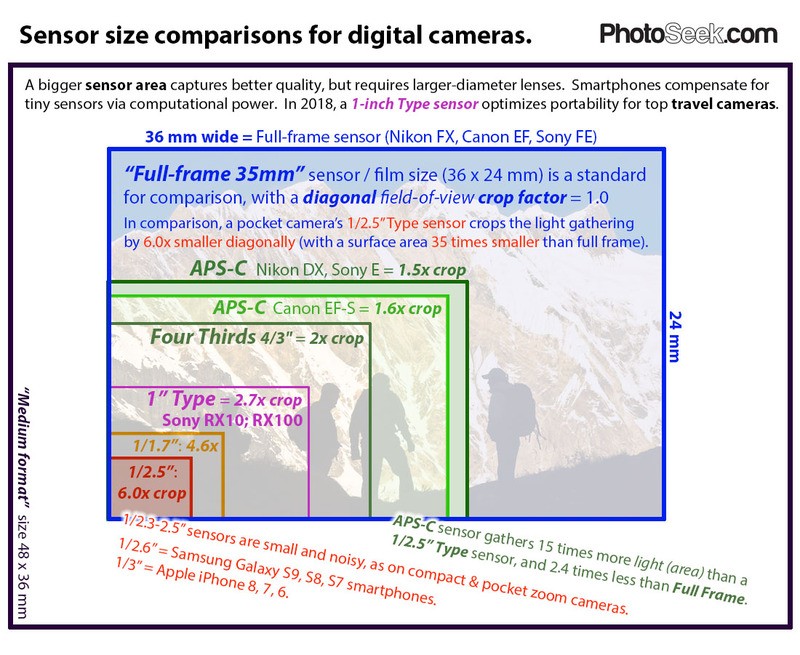 In this illustration, compare digital camera sensor sizes: full frame 35mm, APS-C, Micro Four Thirds, 1-inch, 1/1.7″ and 1/2.5” Type. For new digital cameras, a bigger sensor area captures better quality, but requires larger diameter, bulkier lenses. To optimize the size of a serious travel camera, consider 1-inch Type sensor or up to APS-C sensor size. “Full-frame 35mm” sensor / film size (36 x 24 mm) is a standard for comparison, with a diagonal field-of-view crop factor = 1.0 In comparison, a pocket camera’s 1/2.5” Type sensor crops the light gathering by 6.0x smaller diagonally (with a surface area 35 times smaller than full frame). Join me and get inspired by what Bill Gates calls his new “favorite book of all time”: Enlightenment Now: The Case for Reason, Science, Humanism, and Progress (2018), by Steven Pinker.